A native of Australia, Patrick Wanis, PhD engrosses audiences with passion, conviction and sincerity with his blend of the strong masculine (Dr. Phil); the warm, compassionate feminine (Oprah); and the clinical scientific mind (Dr. Drew.) Anointed “The Woman Expert” by WGN Chicago and syndicated TV show The Daily Buzz, Wanis is a renowned Celebrity Life Coach, Human Behavior & Relationship Expert, SRTT therapist and author with worldwide credits. When Michael Jackson died, CNN turned to Wanis for his expert insights and analysis of Jackson’s life, MSNBC turned to Wanis to understand Robin William’s death, CNN published on its homepage Wanis’ article “Forgiveness for Casey Anthony?” and FOX News published Wanis’ article “13 California kids locked in a house of horrors — Just one hero could have saved them so much sooner.” Wanis has also taught and worked with patients at Milestones Ranch Malibu Residential Treatment Center, and he is the first person ever to do hypnotherapy on national TV – on the Montel Williams show. You might say Patrick Wanis was born into the field of therapy and counseling – not because his parents were psychiatrists but because they desperately needed one! At age 11, Patrick was thrust into the role of caretaker and was handed the responsibility of his newborn brother, and soon after his second newborn brother. Patrick changed their diapers, disciplined and guided them, essentially, raising them. Patrick did the same for his parents (sans the diapers.) One day when 10-year-old Patrick was crying, his mother said “Don’t cry, you are my tower of strength.” That was a turning point for young Patrick, when he became strong for ‘other’ people. Patrick was groomed into the role of therapist by and for his family. His innate sense of caring, empathy and compassion became apparent early on as he also cared for his ailing grandmother, who lived with them until her death. Whenever his father experienced anxiety, jealousy and insecurity, he would rely on teenage Patrick for advice while Patrick’s mother would treat him, at times, like a spouse. As young as age 21, Patrick would mediate marital arguments between his parents. Patrick Wanis has served as the Human Behavior & Relationship Expert for American Media Mini Mags, The National Assoc. of Divorce for Women and Children, Comcast – Dating On Demand. He has been featured and quoted in CNN.com. FOXNews.com. MSN.com and magazines as diverse as Cosmo, Rolling Stone, USA Today, InTouch Weekly, The Enquirer, New York Daily News, Us Weekly, The New York Observer, Natural Health, Women’s Health, Men’s Health, It’s all in the JOURNEY – recovery magazine, Vogue Australia, Semana Colombia, FHM UK, Viva Dubai, and D la Repubblica Italy. Wanis has coached various celebrities, consulted to major corporations, appeared on radio & television and published books on human behavior, relationships, the mind & personal development. Over five million people have read his books in English & Spanish. Wanis is a superior expert in the areas of sexuality, human motivation, addiction, body language, persuasion, communication and women’s issues: Much of his work has focused on examining the role of the mind, body and physiology on behavior and psychological functioning. Wanis holds a PhD A.M. (Health Psychology, Human Behavior & Hypnosis) from the Open International University for Alternative Medicine, Bachelor of Science in Communication, Associate Degrees in Dramatic Arts (Media) and Speech, Script-Writing & Communication from Australia, Associate Degrees in Advanced Hypnotherapy and Neuro-Linguistic Programming (NLP) from the World Institute of Cognitive Sciences, Pennsylvania. Wanis consults and trains major corporations such as El Paso Energy, Exxon, American Airlines, Doubletree & Hilton Hotels, Equinox Fitness. Wanis began his career in Australia on stage, radio, and television; worked as executive producer & talk show host of News/Talk Radio 3AK and Political TV reporter for Ten News. The Australian Journalists Association awarded Wanis the elite ranking Grade A Triple-Plus Journalist. At age 23, he became the youngest talk show host in Australian history, interviewing the Australian Prime Minister on radio and TV. Wanis is a phenomenal radio & TV presence. He’s enthralling – answers smart & fast and thinks even faster, employs an arch sense of humor with his seductive Australian accent. Wanis provides extraordinary insights into women’s issues, sexuality and human behavior with practical applications for everyday people, as well as unraveling and revealing the subconscious motivations & drives of people in the news, such as Lindsay Lohan, Charlie Sheen and Arnold Schwarzenegger. 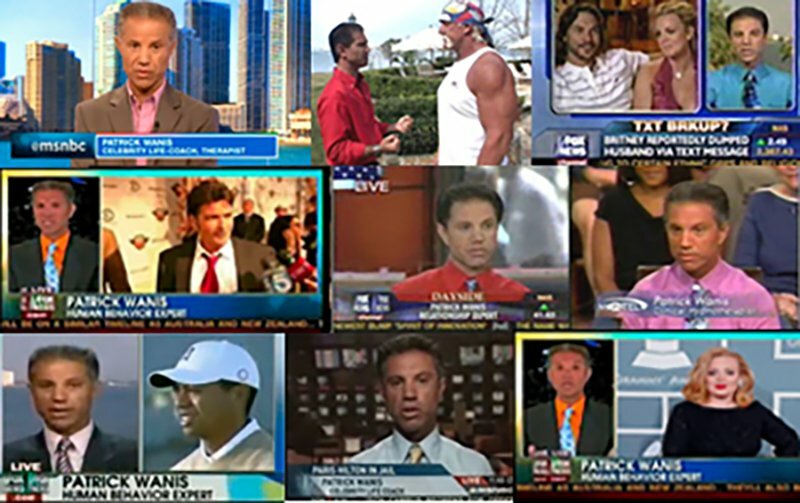 In 2007, Wanis began his annual list of The Top Ten Celebrity Meltdowns and became recognized as the expert on celebrity behavior; his meltdown list is featured each year on FOX News Channel.